One of the beauties of art is that its ever-changing nature constantly redefines what beauty is. Throughout history, whether as an aspect of culture or a representation of a practical part of life, art has served some type of form or function, and capturing its path throughout the years has constantly been on the forefront of people's minds. 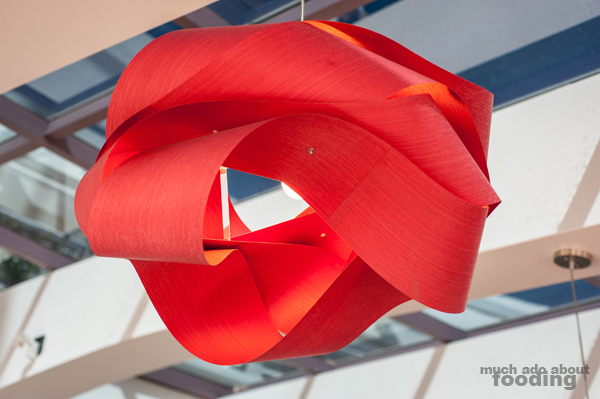 At the Bowers Museum in Santa Ana, their newest exhibition, The Red that Colored the World, documents the history of the color red and all the parts of life that have been affected by this hue. 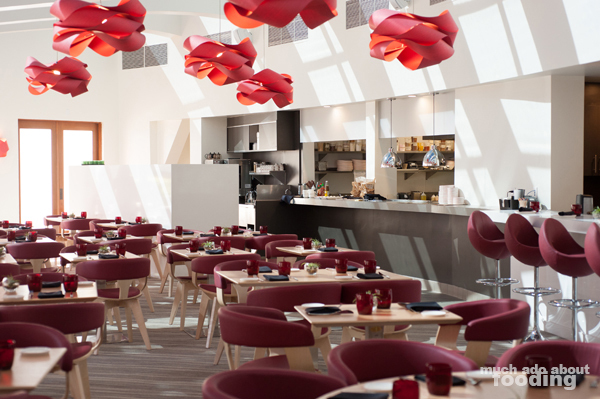 With its debut also comes the reopening of the museum's in-house restaurant, Tangata, which was closed for renovation and has now opened with a brilliant new design from renowned Los Angeles-based designer Heather Aston. 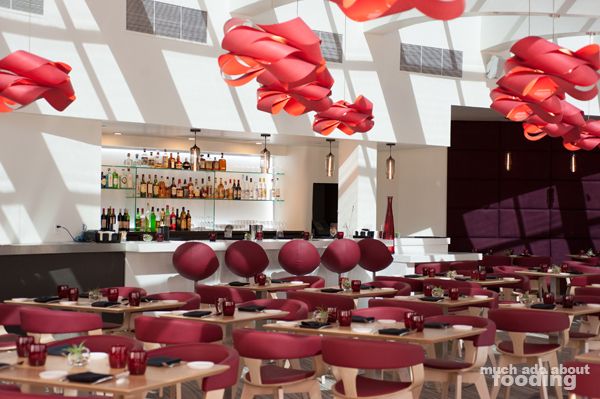 The redesign of the space also brought in a revamped menu featuring Pacific Rim-influenced dishes by Executive Chef Donald Harris, a menu we were eager to try and did upon invitation. 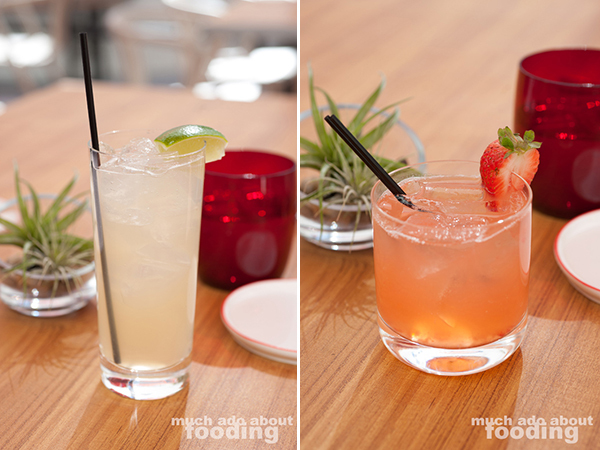 Right when we walked in, we saw just how much the color red has affected the restaurant's new-found scheme. The Bowers Museum's exhibit has influenced the elements of the design in palette, and its clean, sleek aesthetic lets you know it is both modernly beautiful and welcoming to conversations. The main dining area has kept its open brightness intact with floor-to-ceiling windows and abundant skylights. The juxtaposition of passionate reds to muted tans gave lively, creative accents to a relaxed space. Connecting both the exhibit to the museum's own history, the patio was a pleasant bridge in design because it maintained the mission look and feel of Bowers while featuring bold red glasses on each tabletop. After we received bread and coconut whipped butter, the first bit that we looked at was their cocktail menu which was divided into different regions of the world: North America, South America, Far East, and French Polynesia. My cocktail order was the Peruvian Smash ($11 - pisco, orgeat, lemon, and strawberries), a fruity drink that was a little heavy on the alcohol but still had apparent fruit notes. Duc, on the other hand, went for the East Asian flavor of their Cambodian Mule ($12 - lemongrass-infused vodka, kaffir lime, sugar, and ginger beer) which featured interesting twists to typical components to a mule such as the lemongrass-infused vodka and use of kaffir lime. We had hoped that the kaffir lime inclusion would be more prominent than it was but it was barely noticeable. However, the ginger beer fizz made this a quick and easy drink, and the lemongrass aroma really shone through. The menu boasts "Pacific Island food, California freshness, Asian cooking techniques, and ingredients from Japan, China, Thailand, Korea, Philippines, New Zealand, Australia, United States, Mexico, and South America" which was proven true with a cursory glance over the appetizer selection. Options such as Chicken and Pork Egg Rolls, Spam Tacos, and Crispy Calamari were easy pickings but we chose to go a different route. We shot for their Candy Stripe Beet Salad ($10 - togarashi pepper, fennel, toasted peanuts, fresh herbs, and anise vinaigrette) which was a work of art in itself, beautifully designed and plated. 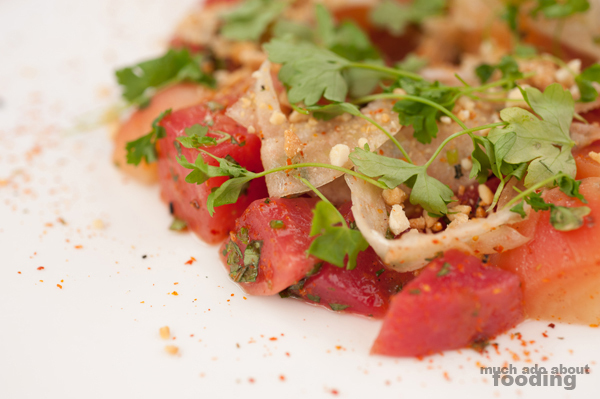 The ingredients were all very playful with one another, highlighting different notes and textures that brought everything together into a well-balanced plate. 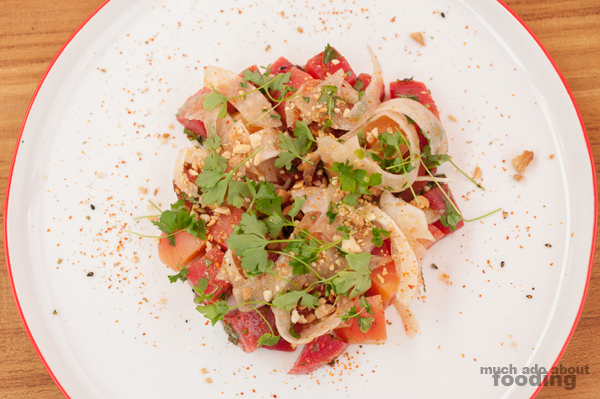 We could not get enough of this vibrant salad for its sweet beets, lightly spicy togarashi, crunchy fennel, savory peanuts, bright fresh herbs, and unique anise vinaigrette. 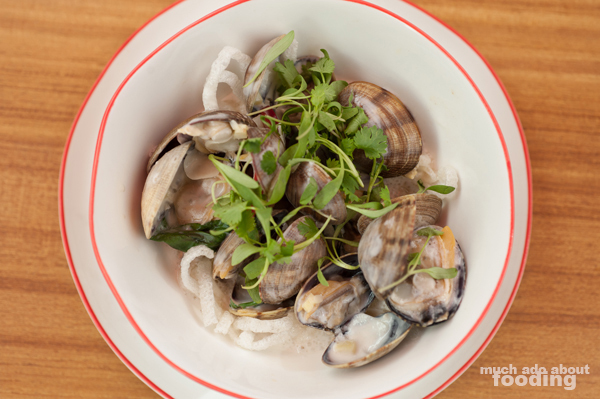 Then we moved on to their Manila Clams ($10 - steamed Manila clams, ginger, scallions, coconut milk, and Thai basil) because it seemed an appropriate mix between Asian and Californian flavors. 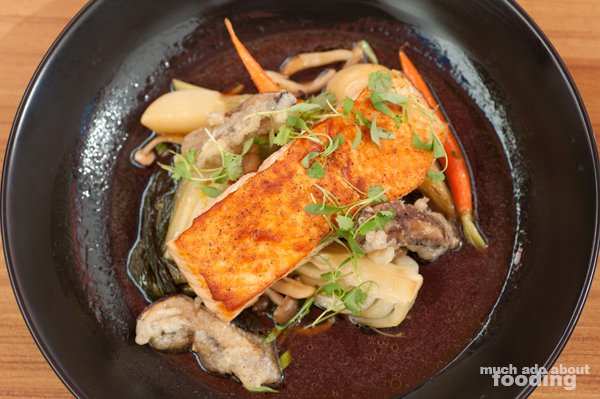 It showcased thick coconut milk broth while maintaining the freshness of the seafood. 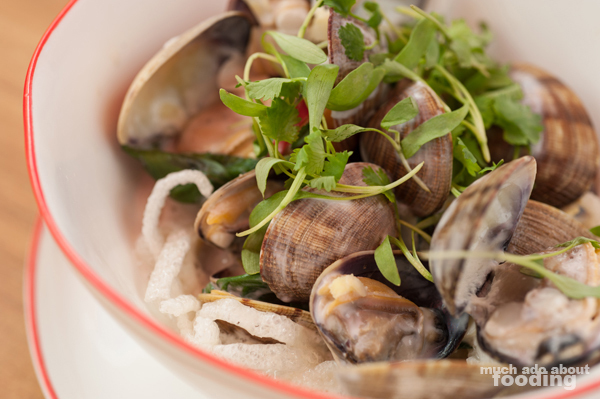 There were also some rice noodles that added an interesting mix into each bite mainly because parts of the noodles remained crispy while parts that had been exposed to the broth became a comforting, rice-y mush that gave the appetizer a feeling of being the main course. We loved how the ginger and scallions cut through the broth enough to help us finish everything off almost immediately. For entrees, there were several options whether you wanted to go with a salad, sandwich or typical entree. So to get a view of the separate sections, I ended up getting the Laughing Bird Shrimp Salad ($18 - gem lettuce, mango, avocado, cucumber, green papaya, and passionfruit vinaigrette) and he went for the Yuzu Kosho Salmon ($20 - Portobello tempura fries, baby bok choy, baby turnip, shimiji mushrooms, and cilantro-ponzu broth). Other entree options included Seared Tuna Tataki Sandwich, Teriyaki Burger, Island Caesar, Chicken Banh Mi, Thai Style BBQ Chicken, and Korean Marinated Skirt Steak. The salad, to be frank, did not look nearly as appetizing or artistic as the previously enjoyed beet salad. 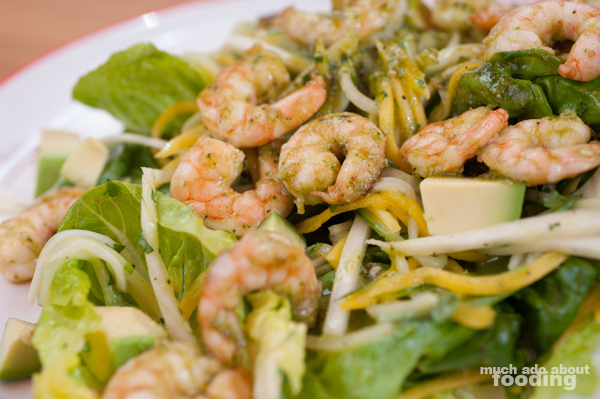 The majority of this dish was composed of loud, startling shades of green. One can't judge a book by its cover however. 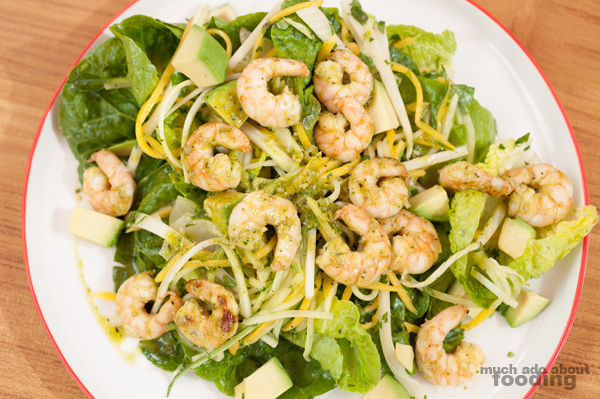 There was a generous amount of shrimp in this salad, and the avocado added a buttery consistency to each bite to accompany the shellfish. The passionfruit in the vinaigrette was not as nuanced as I had hoped unfortunately but the gem lettuce was very crisp as were the mango and green papaya, lightening the whole plate in texture and feeling. As for the salmon, Duc said it was probably one of the best pieces of salmon he has had. The Portobello mushroom fries were a fine touch and reminded us of the tempura fried vegetables that are often had with udon. 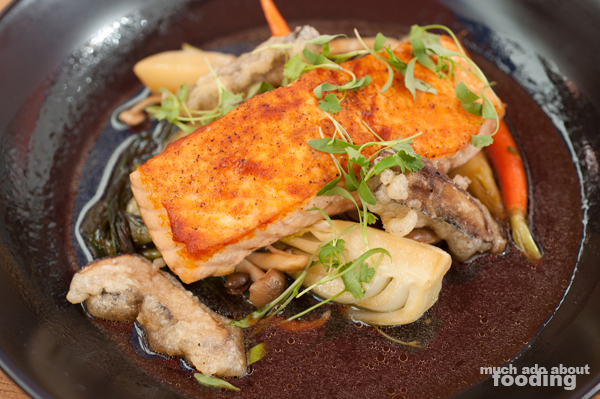 The abundance of mushrooms gave heft to the dish but also did not detract from the rich flavor of the fish. 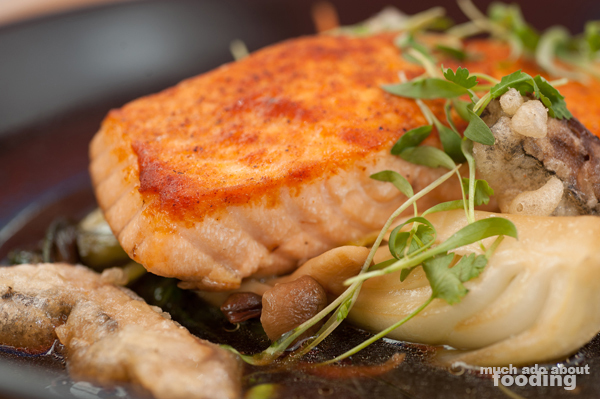 This salmon was moist and flaked away with plenty of savory mouthfeel in every mouthful. Additionally, the baby bok choy sopped up broth as we worked our way around the large portion of salmon. 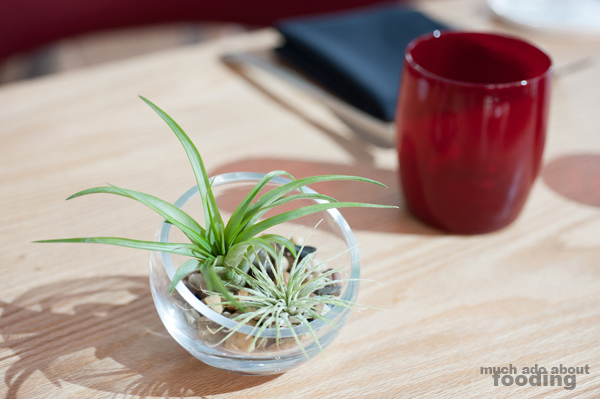 We were especially thrilled with the bursts of sharp flavor from the microgreens that garnished the dish. After all of that, we weren't even sure if we could handle dessert but the options were too tempting from Creme Brulee to Banana Spring Roll to Sorbetto & Gelato. 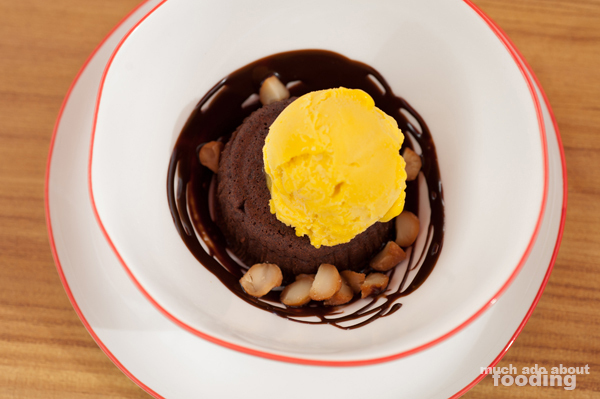 Eventually we decided to stick with their Chocolate Fondant ($8 - candied macadamia nuts, chocolate rum sauce, and mango sorbet) which came with a hefty scoop of delicious mango sorbet. 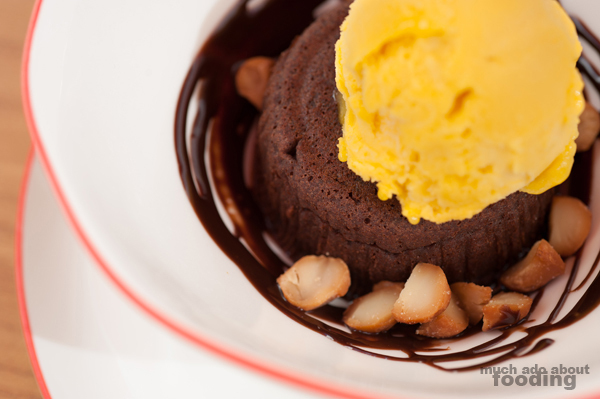 The cake was dense but moist and paired very well with the tart mango. For the desserts that were seasonal, many of the chef selections were Asian-inspired as well; the creme brulee was coconut and the gelato, green tea. After the lunch, we walked through the Bowers Museum exhibit on the color red which was educational and revealed explanations to some pieces of our current day lives. Even if you do not visit the museum, you would be remiss to miss out on Tangata and the amazing dishes that this new menu contains. Find the restaurant at 2002 North Main St, Santa Ana, CA 92706. We have always enjoyed anything from any of the chefs involved with the Patina Restaurant group, and this is just another one of the successes that they can chalk up to their group!